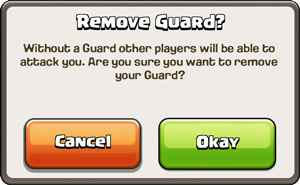 The Village Guard and Personal Breaks are few of many General elements of the Clash of Clans game. The best in offense and defense! 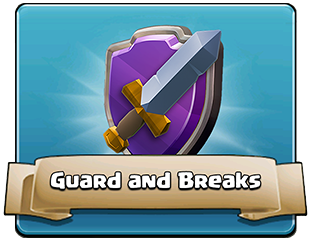 Guard prevents attacks on your village while letting you attack others all you want. Only available while Shield is down. Think of the Village Guard like giving your device to your little brother to keep you online – except that the Village Guard won’t embarrass you in Clan chat and spend all your gems. If you ever need to step away from your device for a small period of time, the Village Guard stands ready to watch over things until you get back, even if you close the game. The Village Guard will also help players get back to the game even if they are a few minutes late after their shield expires, and will let top-level players play completely free of the stress of an unintentional disconnect due to inactivity. “Anyone There?” Yes! The Village Guard! The Village Guard was added to the game in the 10th December 2015 (Town Hall level 11) update. 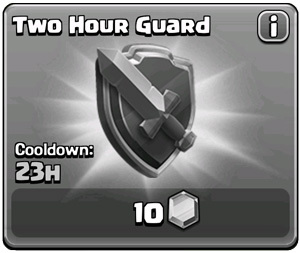 2 hours of extra Guard is available in the Shop every day. While Village Guard is active, your village acts as if you are online, even if you close the game or get disconnected. Players can freely attack through Village Guard with no penalty. Free Village Guard time activates automatically when shields expire, from 15 minutes to 3 hours long based on League. Active Village Guard can be dismissed at any time (to intentionally take a defense). All Clashers know the frustration of forgetting about their shield expiry, opening the game just a few minutes too late, or leaving the game idle a bit too long, and getting attacked right under their nose. To help prevent these cases, an automatic Village Guard period is activated every time a shield expires. Master I League and below: 30 minutes free Village Guard. 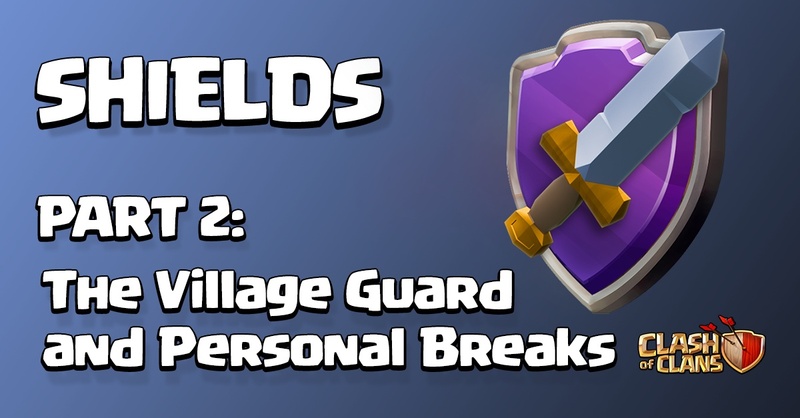 In the case of exceptionally poor attacks that do less than 30% destruction (or for Chiefs who neglect to bring their Town Halls inside and get “sniped”), an automatic 15-minute Village Guard period will activate to give shieldless defenders a chance time to rearm Traps, reload their defenses and request defending troops to their Clan Castle. 2 hours of extra Village Guard can be bought for 10 gems every day in the shop, when your Shield is down (23 hour cooldown). You can’t buy the Village Guard when your Shield is still active. Personal Breaks make sure everyone defends regularly. The existing Personal Break system is also related to any talk about online time. Personal Breaks place a time limit on how long any one player can stay online without a shield until the game says, “Okay, to play Clash you have to defend, and it’s fair time other players get a chance to attack you.” The player is then kicked offline for a few minutes of matchmaking time to allow attackers that chance. Personal Break Timer (PBT) is 4 hours: forced offline for 6 minutes after 3 hours cumulative online time without Shield. PBT resets when gaining Shield, or in other reset cases below. Buying 2-hour Village Guard from shop extends current PBT by 2 hours. PBT paused during server maintenance, but not reset. After 15 minutes consecutive offline time without defense: Full PBT reset (no Village Guard given). Earlier (till 10 December 2015) PBT was 6 hours and forced offline time is 2 minutes. In the 17th December 2015 Update added an info screen when tapping the Shield icon that shows exact Personal Break timer status. While both the Village Guard and Shield do the same job of holding off the next attacker, they are used in different ways. Village Guard is intended to support active play time, while Shield is intended to provide opportunities for downtime from the game. For example, if you need a 15-minute break for a shower or a 90-minute break to go pick up a friend, or if you want to boost your Barracks and have an intense 2-hour play session of constant attacking, the Village Guard can be used to make sure you don’t get attacked in the middle of it, even if you get distracted for a while or accidentally go offline. Keep in mind that active Village Guard time will ALWAYS count towards the Personal Break 3-hour limit, even if the player is offline for all of it. However, buying the extra 2 hours of Village Guard from the shop will add 2 hours to the current Personal Break 3-hour limit to make sure it can be fully utilized. Shield allows players a chance to take longer breaks from the game, the Village Guard helps players stay online reliably when they want, and the Personal Break system makes sure everyone defends fairly. The three go hand-in-hand with the overall goal of supporting Clashers’ existing gameplay strategies, and to do it in a fairer and more flexible way. Changes to multiplayer matchmaking, loot and Trophy offers, covered in our next post, will help balance things even further.